Where were you before the World’s Tallest Water Sphere existed? Since Union’s water tower was built in 1964, you would have to be at least 45 years old in the year 2009 to qualify. First of all, the World’s Tallest Water Sphere did not exist. In fact the land that hosts the WTWS today, shows up on the map as “Sayre Park.” If you visually cross Morris Avenue, there is also park land. Today it hosts a Lowe’s home improvement store. Older readers might remember this as the site of “Two Guys” department store. Route 22 with its islands and multiple U-turns is quite visible crossing the middle of the map. A dotted line through Kenilworth, Union, and northward through Irvington suggests the future site of the Garden State Parkway. Interstate Route 78 does not exist. The familiar arteries of Chestnut Street, Stuyvesant Avenue, Morris Avenue, Vauxhall Road, and Salem Road are present. Five Points down south looks to be the ever present mess it is today. Notice Burnett spelled with two Ts. Vaux Hall spelled as two words. The western most part of Union is filled with interesting historical bits. 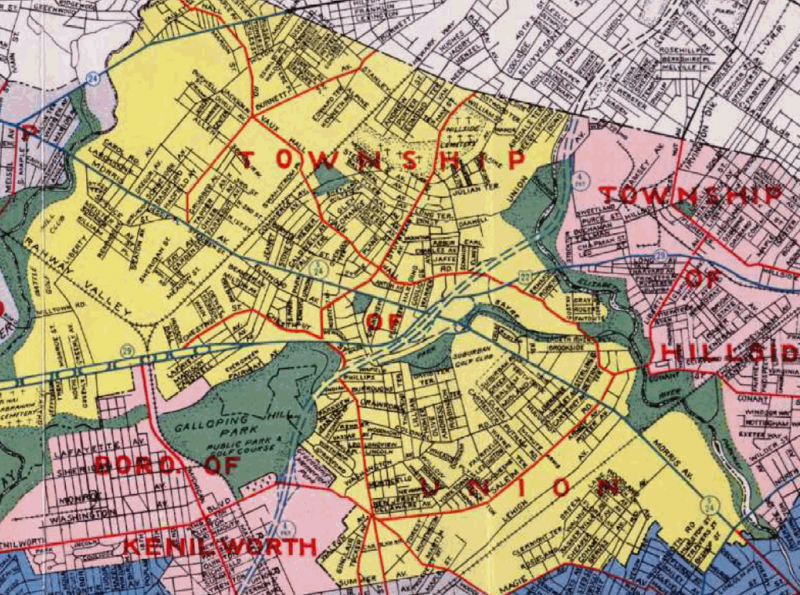 The Rahway River and the familiar bend of Liberty Avenue/Springfield Avenue lead to Route 22, but there is no Battle Hill School, no Rahway Avenue, no Hickory Road, no Pinewood Road. The many houses are preceded by the Battle Hill Golf Club. Imagine that, golf in west Union! If you lived in Union before 1964, why not write this web site and tell us what life in old Union was like. This entry was posted on Wednesday, January 21st, 2009 at 2:46 pm	and is filed under Fun Facts, History. You can follow any responses to this entry through the RSS 2.0 feed. Both comments and pings are currently closed.